Iberdrola / Scottish Power - Has started trials with a 1 MW carbon capture unit at the Longannet coal fired power plant in Fife. The unit has been designed by Aker CleanCarbon and will investigate the performance of a number of amine based solvents. E.ON (UK) - Propose to construct a new carbon capture ready power station at Kingsnorth in Kent by 2014. Mitsubishi Heavy Industry (MHI) and Foster Wheeler have recently been awarded a pre-FEED design study. RWE.nPower - Recently purchased a majority shareholding in Peel Power which had originally pre-qualified as a bidder for the competition. RWE have recently commissioned a test facility at Didcot in Warwickshire. This is believed to be an Alstom chilled ammonia unit. A post capture unit has been selected for the demonstrator because the technical challenges are more manageable and because the opportunities to retrofit units to existing power plants once the technology is proven will be good. 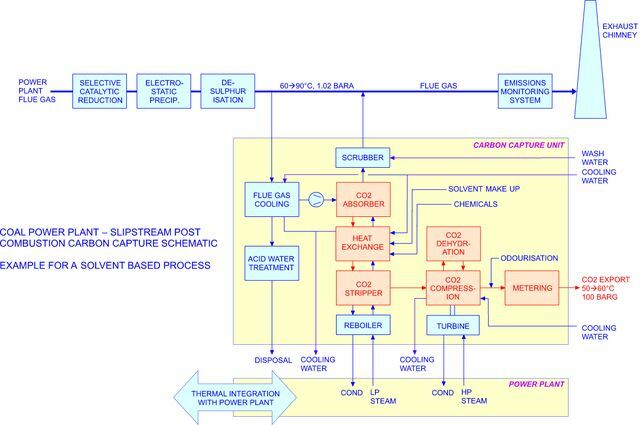 Other power plant carbon capture technologies (see future blog) include pre-combustion and oxy-fuel, trials of which the UK government may also be preparing to fund. The unit will be designed to capture a portion of effluent gases - typically, equivalent to some 15-20% of the thermal output of the power plant. Whilst the capture of carbon dioxide from low pressure effluent gases is relatively straight forward, the key requirement is to develop sorbents that can reduce the overall cost of capture - typically, to less than 15 euros / tonne. Operating costs using existing amine based solvents are much higher because a) their carrying capacity is relatively low and subject to degradation when exposed to contaminants such as oxygen in flue gases, b) energy is required to regenerate the absorbing media and c) carbon dioxide is reclaimed from the sorbent at low pressure - in turn, necessitating additional compressor power to raise the pressure of the gas to that required for export. NB: It has been claimed that the chilled ammonia process may be more efficient, but an evaluation of its overall energy needs must take into account the demands of its refrigeration plant. Thermal integration of the capture unit with the power plant reduces overall efficiency of the power plant. This in turn, increases the amounts of carbon dioxide and other pollutants (SO2, NOx) that will have to be treated for a given power output. Carbon dioxide can be transported as a dense phase / supercritical liquid at pressures above 74 barg and temperatures higher than 31°C. Higher pressures will be required for injection into reservoirs - for the demonstrator and future projects, these are likely to include depleted offshore oil or gas fields. 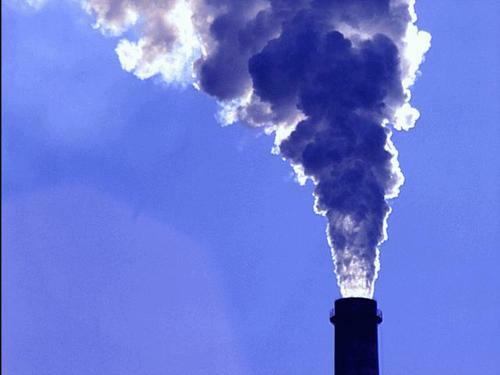 The European Emissions Trading Scheme currently limits quantities of carbon dioxide that can be generated at individual sites. This will require careful management of existing and new entrant quotas, particularly if new stand-alone gas fired turbines are used to power CO2 compressors, rather than steam turbines integrated with operation of the power plant.